1-18-08 Project Cloverfield - Warning! Spoilers: George Takei Not In New Star Trek Movie? George Takei Not In New Star Trek Movie? It's starting to sound like a mixed bag when it comes to the original Star Trek cast and who will appear in the new J.J. Abrams directed Star Trek movie. It is already confirmed that Leonard Nimoy will be back as Spock and that William Shatner will not return as Captain Kirk. As for the other main players DeForest Kelley (Bones) died back in 1999 and James Doohan (Scotty) passed back in 2005. I haven't heard if Uhura or Chekov will be in the new movie but it doesn't look like it at the moment. George Takei (Sulu) looks to be out at the moment after word came this week that he will not be in the new Star Trek movie. "TrekMovie.com has talked to sources and Mr. Takei himself to get to the truth. The answer is NO"
"The report on AICN states that Takei "recently had lunch with J.J. Abrams," however Mr. Takei tells TrekMovie.com that it was actually a breakfast last fall before filming began on the project. 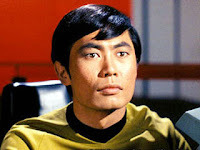 Takei would not go into details about his talk with Abrams because "the whole conversation is privileged," however the actor did express concern over how not commenting has been "turned into an affirmation" that he will appear in the new Star Trek movie.